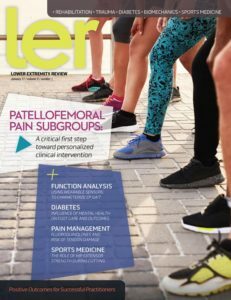 Researchers from the UK have identified three subgroups of individuals with patellofemoral pain (PFP) that can be determined using simple evidence-based clinical tests—a key first step toward developing targeted treatment strategies as part of the ongoing effort to improve PFP outcomes. We hear a lot about various comorbidities associated with knee osteoarthritis (OA), and how addressing those additional conditions can help improve knee pain and function. But a growing body of research suggests one set of comorbidities that knee OA experts may be overlooking are those involving the foot and ankle. Israeli researchers reported in January that New York, NY-based AposTherapy’s biomechanical shoe-like device, which modulates center of pressure during walking, was associated with improved gait measures and quality of life (QOL) in a yearlong longitudinal study of patients with hip osteoarthritis. The American Academy of Orthopaedic Surgeons (AAOS) reported in December that it is accepting submissions for its new online-only journal, JAAOS: Global Research & Reviews, which will serve as an open access companion title to the Journal of the American Academy of Orthopaedic Surgeons (JAAOS). The Beaver Dam, WI-based Pedorthic Foundation in December announced that its scholarships for pedorthic education and training for students and continuing education for credentialed pedorthists and retail footwear professionals are open for application. The American Diabetes Association (ADA) in January appointed William T. Cefalu, MD, its chief scientific and medical officer (CSMO) and reported the renowned physician, educator, and researcher will begin serving in this role on February 20. He replaces Robert E. Ratner, MD, who retired on December 31 after serving as CSMO for nearly five years. Irvine, CA-based Freedom Innovations in November announced that Maynard Carkhuff, its vice chair and chief innovation officer, was elected to the California Orthotic & Prosthetic Association’s (COPA’s) board of directors at that organization’s annual meeting in San Francisco. The Owings Mills, MD-based Board of Certification/Accreditation (BOC) announced in January that it has elected its 2017 executive committee and made two additions to its board. Hoboken, NJ-based John Wiley and Sons and The American Society for Bone and Mineral Research (ASBMR) in January opened submissions for its new open access peer-reviewed publication, JBMR Plus. Medical products specialist Algeos, headquartered in Liverpool, UK, reported on December 28 that the business had achieved a turnover of £11.2 million and profit before tax of £400,000 during the last 12 months and predicted turnover will grow to at least £11.8 million during 2017. Biomechanists from the UK reported in January that an off-the-shelf medical grade shoe made by Mequon, WI-based Dr. Comfort was associated with increased comfort and reduced forefoot pressure compared with participants’ preferred shoes. Indianapolis, IN-based PhysiMax Technologies in December announced the National Basketball Association’s (NBA) Indiana Pacers will use its real-time visual analysis technology to assess player injury risk. The Washington, DC-based American Orthotic & Prosthetic Association (AOPA) in December called for submissions for its 2017 World Congress, scheduled for September 6-9 in Las Vegas. Responding to US Bureau of Labor statistics that estimate employment of podiatrists is expected to grow 14% by 2024, Northfield, IL-based Medline in November announced a collaboration with Indianapolis, IN-based Talar Capital Partners (TCP), a podiatry-specific Group Purchasing Organization (GPO). The Colorado Springs, CO-based United States Olympic Committee (USOC) on January 3 announced its addition of Cheri Blauwet, MD, as an independent member of its board of directors. A to Z Research reported in September that the global foot orthotic insoles market, valued at approximately $2.637 million in 2015, is expected to reach approximately $3.678 million by 2021, growing at a CAGR (compound annual growth rate) of around 5.6% between 2016 and 2021. The Austin, TX-based Hanger Charitable Foundation in December completed its final round of 2016 grants, awarding $225,000 to five nonprofits, the foundation reported. These awards bring the foundation’s total 2016 grants awarded to more than $424,000, given to 25 organizations, according to a Hanger release. Therafirm introduces Ease Microfiber Thigh Highs and Knee Highs to round out the Ease Microfiber line. Like the previously released tights, the new stockings are made with high stretch microfiber yarns that facilitate donning and doffing. Injinji offers the new Spectrum Trail Midweight Crew sock, engineered for runners’ comfort and fit while traversing unpredictable terrain. This midcalf sock incorporates design elements to optimize fit, feel, and protection in any shoe, allowing the wearer to focus on running. Apex Bunion Night Splints help keep the big toe aligned and comfort the pain associated with bunions. The soft bumper pad cushions the big toe, while the adjustable hook and loop strap acts as a lever to gradually align the big toe toward its natural position.